Moving boxes in my office, I came across two patent medicine bottles. The smaller one comes from Philadelphia’s own Dr. Jayne’s. Dr. Jayne’s started selling its tonic in the 1840s and became incredibly successful. By the end of the century, the factory occupied the entire city block on Chestnuyt between 2nd St. and 3rd St. Images of the building can be seen on the cover of Dr. Jayne’s almanac (on these almanacs, see Dr. Jayne’s Family Medicines). 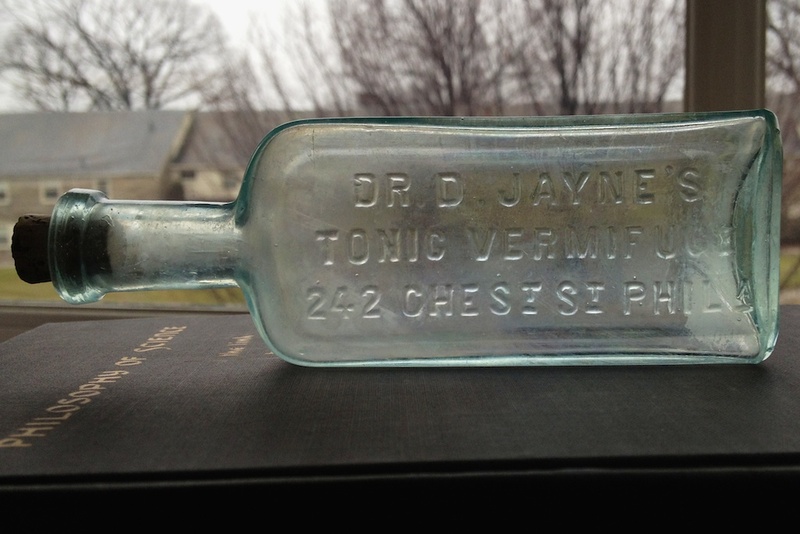 A small bottle from Philadelphia’s own Dr. Jayne’s patent medicine company. The Balsamo Carminativo consisted essentially of opium, a laxative plant drug, probably rhubarb, carbonates, ammonium and potassium salts, aromatics, sugar, alcohol, and water. The Expectorante consisted essentially of opium, an antimony salt, sugar, alcohol, and water flavored with oil of anise and methyl salicylate. The Pildoras Sanativas consisted essentially of aloes, gamboge, and a salt of mercury. The Alterativo consisted essentially of sarsaparilla, sassafras, licorice, potassium iodid, traces of an unidentified alkaloid, sugar, alcohol, and water. The Linimento 6 Contra-Irritante consisted essentially of oils of turpentine, sassafras, and capsicum, and of soap, alcohol, and water. In 1933, 1942, and again in 1943 Dr. Jayne’s was charged with misbranding. Although the ingredients varied, each time they were found to have no therapeutic effect. The second bottle comes from Buffalo Springs in Mecklenburg County, Virginia. Apparently, the springs there were thought to have healing power. By the late 19th century entrepreneurial types were bottling and selling the water as Buffalo Spring Lithia Water, Nature’s Materia Medical, claiming it cured, among other ailments, “Bright’s Disease, Albuminuria, Renal Calculi, Gout, Rheumatism, and all Diseases Dependent Upon a Uric Acid Diathesis.” (see, for example, this ad from 1899). A large bottle that once contained Buffalo Spring Lithia Water. 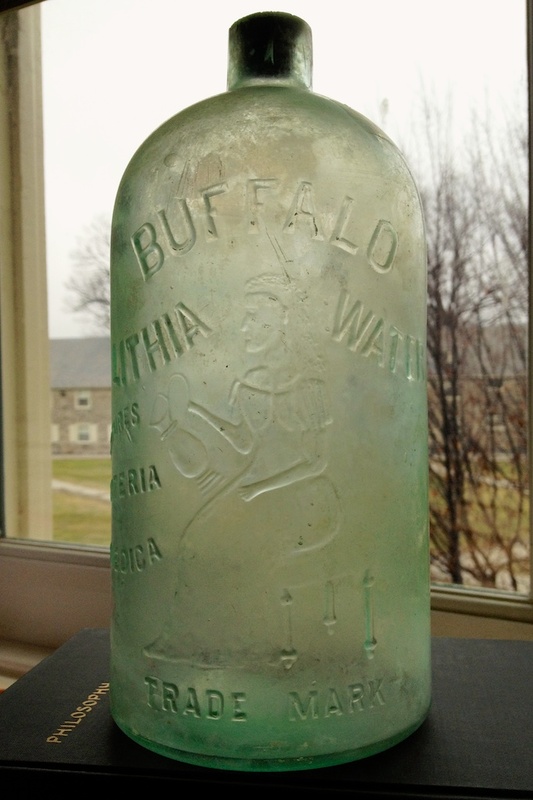 Like Dr. Jaynes, Buffalo Spring Lithia Water was charged with misbranding. Analyses didn’t reveal the cocktail of ingredients found in Dr. Jayne’s, but it also didn’t find any appreciable quantity of lithium, the celebrated active ingredient.